The upgraded super lightweight neckband design makes it firmly fixed on your neck when you are exercising, therefore you don't need to worry about the problem of falling or that your sweat will damage the headset. Perfect for all kinds of sports, including running, jogging, walking, cycling and more. No worry about sweat-damage. The foldable design makes it easy to be put inside the bag or backpack for easy carrying and storage.The automatic retractable cable design is anti-winding and anti-messy. The ergonomic earbuds fit your ears safely, ensuring a comfortable wearing throughout the day, and will not fall off even during running, fitness or general exercise. Dylan Bluetooth headset is compatible with most of the Bluetooth enabled devices. Such as iPhone X / iPhone8/ iPhone 8 Plus iPhone 7 / iPhone 7 Plus / iPhone 6s / iPhone 6s Plus, Samsung Galaxy S9 8 / Note 8 / S6 / S7 Edge, Moto Z / HTC 10 / HTC Desire 10 / ASUS Zenphone 3 / Huawei P10 / 9 Honor8, iPad, iPod, Samsung Galaxy devices, Sony devices, Bluetooth enabled PSP, TV, tablet, computer and more. [FOLDABLE NECKBAND & RETRACTABLE EARBUDS] For the Dylan sweatproof earphones, the durable neckband is very light, therefore you can enjoy your leisure time while almost forgetting the existence of earphones. The retractable cable is anti-winding and anti-messy, it is perfect for sports and will truly free your hands. [HIGH-FIDELITY SOUND] Created by top engineers, it uses advanced and excellent acoustical device to create incredibly good tone quality with deep bass, balanced midrange and clear treble. It will easily control all types of music. [BLUETOOTH 4.1 TECHNOLOGY] Advanced CSR chips and the latest Bluetooth 4.1 provide stable pairing for your Bluetooth devices. It supports the connections with two devices at the same time and will automatically connect after the first successful pairing. It supports most Bluetooth-enabled devices such as iPhone/ iPad/iPod/Samsung Galaxy/ HTC / Huawei. [LONG BATTERY LIFE] A quick charge of 3.5 hours provides a continuous conversation up to 18 hours, 16 hours of music playback and 300 hours of standby, ideal for long-term use. It supports iOS device power display and low battery alarm, allowing you to enjoy your music without any worries. 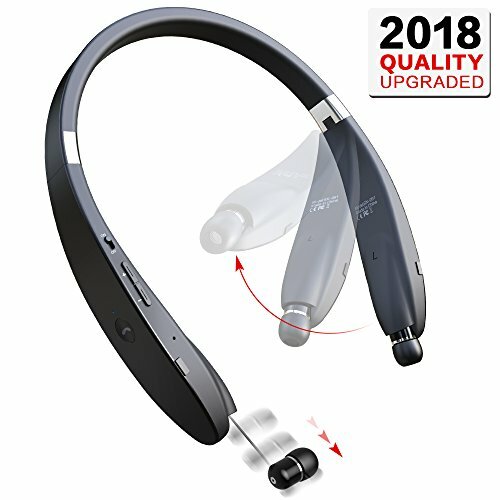 [VIBRATING CALL ALERT] When there is an incoming call, the Dylan Bluetooth headset will alert you by vibration, even if you are in sports or even in a noisy environment.And you can enjoy hands-free calling and easy control of all media features via buttons on both sides of the headset.